What does brake check mean? A brake check is the unsafe action of applying a car's brakes to dissuade a driver who is following too closely. To brake check someone is to perform such an action. A driver who rides the bumper of the driver ahead of him could face a charge of following too closely, he said. [...] But a driver who brake-checks someone he feels is following too closely could face an even more serious charge. At the end of the day it's the leader's right to dictate the pace. I think if you're going super-fast and then slam on the brakes that's a different story but because he was still going so slow at that stage it's hard to call it a brake test. Where does brake check come from? In the 1940s, a brake check was a test of the function of a car’s brakes for safety purposes. Around 1944, law-enforcement officers undertook a nationwide brake check program of routinely testing drivers’ brakes. The contemporary brake check—suddenly applying one’s brakes to fend off tailgating—has been discussed since at least the 1970s, but not necessarily under that name. A 1972 quiz from the Minnesota Department of Highways asked how to deal with a tailgater and offers “slam on the brakes to give him a scare” as one of the (incorrect) multiple-choice answers. An Air Force driving manual from 1975 describes the risks of the maneuver without using the term brake check. As these two uses imply, brake checking is considered very dangerous, as it can cause the following driver to crash into the brake-checking vehicle. Tapping the brakes to startle a tailgater was commonly known as a brake test or brake check by the 1990s. Formula One drivers were reported to describe a fellow driver as giving another a brake test in 1992. Brake check was used in online car forums as a noun in 1993 and a verb in 1994. The term made into it the mainstream press by 1997, appearing in Popular Mechanics. Brake checking is usually discussed in regard to street driving and tailgating, and it has been covered by popular automotive outlets like Jalopnik and Autoblog. 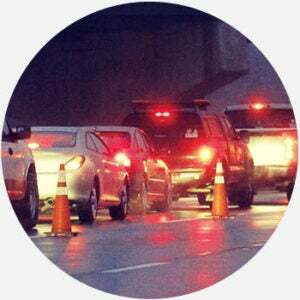 The legality and safety of brake checking has also been discussed in the news by lawyers, police officers, and other officials, as many accidents have been caused by the maneuver. Brake check or brake test has also been used by professional race-car drivers, auto-racing fans, and racing journalists to describe similar actions performed by racing drivers. Brake test, rather than brake check, is more common in these contexts.